Beautiful Blonde-Next-Door Betty inspires a limited-edition colour collection with a soft, innocent sexiness. Lipsticks in peaches and pinks beam bright under layers of Lip gloss in girly shades. Nail Lacquer in Comic Cute and Pep Pep Pep to win Archie's affection. All packaged in exclusive designs. 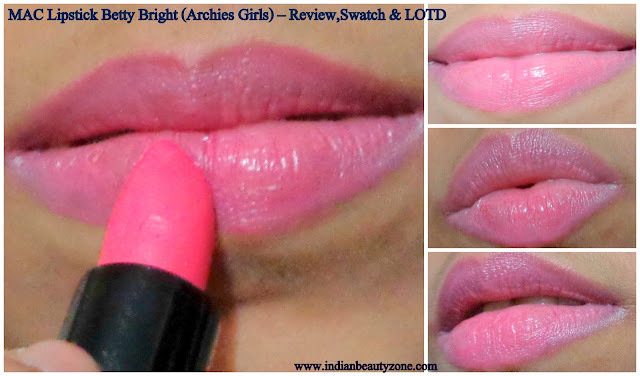 The lipstick Betty Bright is a part of MAC Archies collection as mentioned above. MAC describes it as a “light vibrant peach” in satin finish,but I am disagree with that. I think it is more related to bright pinky-coral with some orange touch also. You can notice this in the below swatches. I found it has some yellow-orange mixed undertone which will suitable most skin tones. MAC lipstick Betty Bright is very creamy and light on lips. The packaging is different from the regular MAC lipsticks and I just loved it. You can see Betty’s picture on the bullet which makes the lippie more classy and attractive. As I mentioned above that I won it at some blogger’s space,but unfortunately when I received the parcel,found that the lippie was broken from the starting point, but as it is my first mac lipstick I stored it in my refrigerator (crazy lolz) and have used only 2-3 times. I love the different type coral shade of this lippie. It looks totally different on lips to the bullet. You can see the difference in my LOTDs. It looks a pretty creamy pink with some orange-ish touch on my lips. Due to the creamy nature of the lipstick , just one or two swipe and a perfect color on your lips means it gives an opaque color coverage. The staying capacity is quite good..stayed for 4-5 hours without any retouch. It has very sweet fragrance which stays for only some time after application. Everything is good but it is quite expensive (due to its packaging I think). Now it’s time for my LOTDs. 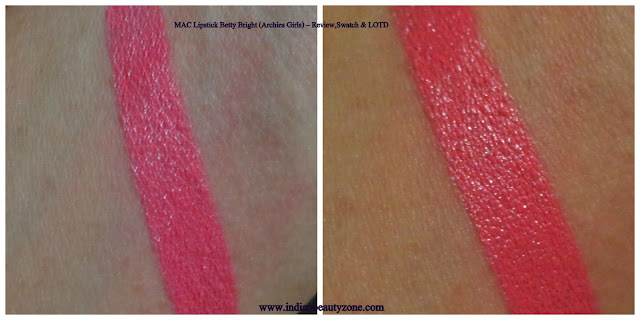 MAC betty bright lipstick is a very pretty pinky-coral lipstick which will suit all skin tones and no word about its quality as it’s from MAC, must have for all beauties. Name: Snigdha Prusti I am a home-maker as well as a new mom of 2 month old baby prince. I have normal skin type . My complexion is fair. I have black, curly(at the ends only) hair. Lipstick/lip gloss and a kajal are very essential part of mine in makeup. In dressing up I like both Indian and western costumes. I love making new friends, cooking and eating as well, travelling,etc. What a fun shade on you! Pretty shade and cute packaging. Now who won't like Archies Girls collection from MAC !! me 2 love this shade.. I love that color and I want it too <33 Super pretty hun! I love Mac, always great products!!!! Adore the packaging but the shade is quite an attraction too. Very cute packaging and nice colour! Its a beautiful shade! Congratulations on winning it, xoxo. This shade is a love at first sight..for me...Very Very pretty shade! Wow! Amazing shade, looks lovely on you!